Learn the Fastest, Easiest Way to Publish and Profit from Your Own Roku TV Channel! Discover the secrets to building, monetizing, publishing and profiting from your own custom Roku TV channel straight from one of the world’s leading experts in Roku publishing and monetization. Mediarazzi founder/CEO Phil Autelitano has published hundreds of successful Roku channels for clients small and large –– from homegrown content creators to major brands, TV and film studios and celebrities. In this one-of-a-kind program, Phil takes you step-by-step through the process of creating and publishing a professional-quality Roku channel –– in as little as 7 days, with zero to little out-of-pocket! You’ll learn the same process he uses to create Roku Channels he charges clients thousands of dollars for. 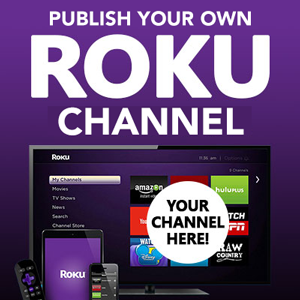 Created specifically with the non-technical in mind, the Publish Your Own Roku Channel program is self-paced and requires no prior coding knowledge or experience. It all starts with Publish Your Own Roku Channel, Phil Autelitano’s definitive, 130-page Roku Publishing ebook (.pdf) that takes you step-by-step through the process of building, monetizing and publishing your own, custom Roku Channel using Roku’s Direct Publisher tool. The only book of its kind, written by one of the leading experts in Roku Publishing and Monetization, it’s a must-read for anyone looking to build and publish a Roku Channel, and it’s ONLY available with this program! Discover the fastest, easiest way to publish a Roku Channel with $0 out-of-pocket! Next, you need the tools to make it all happen. Phil has taken out all the stops to provide you with up-to-date Roku Channel Graphics, a pre-built Channel Feed and simple, hands-on instructional guides anyone can follow. These tools alone are worth TWICE the cost of the program! No prior graphics or coding experience needed. Easy-to-use graphics templates and an informative guide for creating awesome, custom Roku Channel logos and graphics. Phil makes creating and managing a Roku Channel Feed easier than ever with his pre-built JSON feed template and hands-on coding and update guide. This guide reveals dozens of sources for “free” and “zero out-of-pocket” video content that you can acquire, monetize and distribute with your Roku Channel! Even if you don’t already have content, you won’t need it if you have this guide. There’s more than one way to monetize your Roku Channel and no one knows that better than Phil. In this guide, he reveals the TEN best ways — which is nine more than most Roku publishers know. Phil’s popular marketing guide updated with dozens of strategies, tips and techniques for promoting your Roku Channel. Learn how to scale it fast, build veiwership and ultimately …profits! You’ll also receive Free Lifetime Access to Phil’s exclusive “Inner Circle” Roku Forum where you can interact with other Roku Publishers along with Phil and his team to get all the advice, guidance and answers you need when you need them! If that’s not enough, Phil and his team are always just a click away to assist you with all aspects of publishing your Roku Channel via email or online chat. You’re never alone in this! Start Publishing Your Roku Channel in the Next Ten Minutes! Phil’s entire Publish Your Own Roku Channel program, including all the tools, bonus guides and support listed above is available for immediate download for just $47.